Having installation trouble? 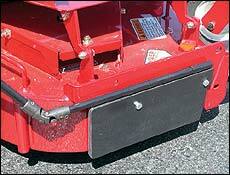 Click here to see the Blade Blocker installed on walk behind mowers. The first and only discharge baffle designed to maintain compliance by operating in conjunction with the factory installed discharge shield on your mower. With Blade Blocker on your mower you can quickly open and close the baffle from your seat. Just think, no more blowing grass clippings off of mulched areas or vehicles. Your properties will look much better the first time you use Blade Blocker, and your labor to clean up will be considerably reduced! Best of all your customers will not complain about grass clippings in freshly mulched areas. The unique design incorporates a multitude of features that provide versatility and adjustability. 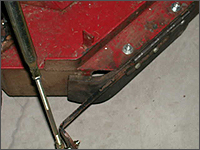 Blade Blocker installs on practically any "zero turn" or "stand on" mower. Send us your pictures of your Blade Blocker installations so we can share them with everyone! A unique feature of the baffle material is that it can be heat formed to match a curved portion of the mower’s discharge opening if required. 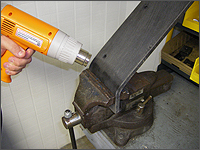 To shape the baffle, use a heat source such as a heat gun, to heat the area which needs to be formed. 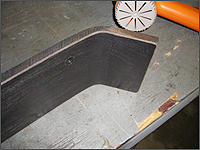 After heating the baffle, it can then be formed to the required shape. Following cool down, the baffle will retain its formed shape. Discharge chute in photos is shown in the raised position for illustration purposes only. The pictures above are illustrations ONLY. 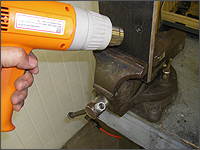 Discharge chutes will need to be notched for proper operation. 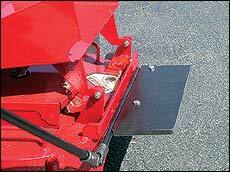 Blade Blocker is designed to operate in conjunction with the discharge deflector shield on the mower. 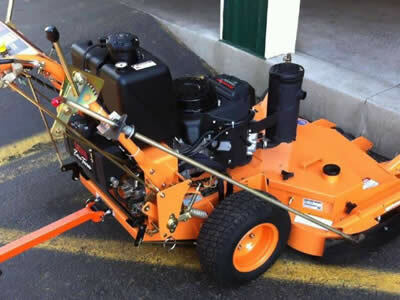 Blade Blocker is not intended to be used as a mulching plate or in the place of the discharge shield. Its purpose is to temporarily block the discharge opening in order to prevent large volumes of grass clippings from being discharged onto areas where they are not desired.